First version is the most common in Lufthansa. The seats in this version of Airbus A330-300 are divided into three classes. First class has 8 flat bed seats located in two rows per 4 seats in each. The seats of the 1st row have no floor storage during take-off and landing. There are 48 flat bed seats in the Business class. These seats are located in 8 rows per 6 seats in each. Business class has two sections. In the first section there are 2 rows of seats. The only disadvantage of the seats of 4th row is close location of the galleys and lavatories. Second section of the Business class has 6 rows of seats. Passengers of the seats of 10th row will take advantage of extra space for their legs. However, proximity of the galleys and lavatories may be a problem. These seats are often given to passengers with babies as these seats have bassinet location. Economy class may transport 161 passengers. 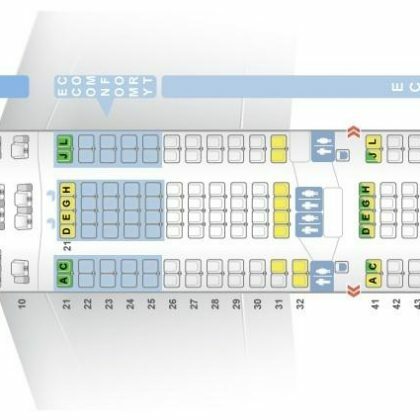 The seats of the Economy class are also divided into two sections. 27 seats are located in the first section. The seats of the 24th row have limited legroom. As the tray tables are in the armrests, the width of these seats is reduced a little. Also these seats have no floor storage during take-off and landing. The seats 25D and 25G have some extra space for passengers’ legs. The TV and tray tables are built-in the armrests making them immovable and reducing the width of these seats. Another disadvantage of these seats is lack of floor storage during take-off and landing. The seats 25E and 25F have restricted legroom and they are a little narrower than other standard seats on the airplane. The seats of the 27th row are less reclining and their close location to the lavatories may be bothersome. In front of the second section of Economy class exit row is located. That is why the seats of the 30th row have extra legroom. Close location to the lavatories may represent a problem for passengers of these seats. The seats 30DEFG are a little narrower as the tray tables are in the armrests making them immovable. The seats 40D and 40G are standards but are often bumped by other passengers passing by and crew members due to the missing seats behind. The seats 41DEG may have limited space for passengers’ legs and reduced width. The main disadvantage of the seats 46AC and 46HK is proximity of the galleys. The seats 46DEG are considered bad seats as they may have limited recline and are located close to the galleys. The second cabin version of Airbus A330-300 operated by Lufthansa has seats of 4 classes. There are 8 open suites in the first class. The only disadvantage of the seats of the 1st row is proximity of the galleys and lavatories. Business class is divided into 2 sections. First section has 2 rows of seats that have 2-2-2 configuration. There are 18 seats in the second section that are located in 3 rows per 6 seats in each. All the flat bed seats of business class are standard only close location of the seats of 10th row to the lavatories and galleys may represent a problem. Premium Economy class has 21 seats located in 3 rows. The seats of the 20th row may have limited legroom because of the bulkhead position. Economy class may transport 177 passengers. The main disadvantage of the seats of 23rd row is restricted space for passengers’ legs. Proximity of the lavatories may be bothersome for passengers of the seats 27C, 27DEFG, 27H and of the 28th row. Passengers of the seats of the 29th row and of the seats 30AC and 30HK will take advantage of the extra space for their legs as exit row is located in front. Among disadvantages of these seats are: lack of floor storage during take-off and landing, reduced width of the seats and proximity of the lavatories. Crew members and other passengers tend to bump into the seats 40D and 40G. The seats 41DEG have limited legroom. Close location to the galleys may represent a problem to passengers of the seats of the last 46th row. Airbus A330-300 of this type has four-class cabin. First class has 8 open suits located in two rows per 4 seats in each. The only disadvantage of the seats of the 1st row is close location to the galleys and lavatories. Business class may transport 42 passengers on flat bed seats that have 2-2-2 configuration and are located in 7 rows. The seats are located in 2 sections. First section has 2 rows of seats. The second section has 5 rows. All these seats are standard only proximity of the lavatories and galleys may be bothersome for passengers of the seats of the 10th row. Premium Economy class has 21 seats located in 3 rows that have 2-3-2 configuration. The seats of the 24th row have limited space for passengers’ legs because of the bulkhead position. There are 145 standard seats in Economy class. The seats of the 27th row have also restricted legroom and are located close to the lavatories. Proximity of the lavatories may also represent a problem for passengers of the seats of 28th row. 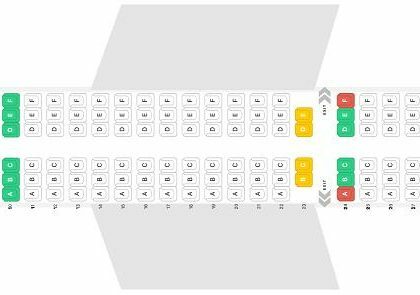 Passengers of the seats of the 29th row (29DEFG) and the seats 30AC and 30HK will take advantage of extra space for their legs due to the emergency exit located in front. Among disadvantages of these seats: proximity of the lavatories, reduced width of these seats and lack of floor storage during takeoff and landing. The seats 40D and 40G are standard but as there are no seats behind other passengers and crew members tend to bump into these seats. The seats 41DEG may have limited space for passengers’ legs as these seats are misaligned with the seats located in front. The seats of the last 46th row are considered bad seats as these are seats of the last row in the airplane. Close location to the galleys may be bothersome.